Perhaps it was the abundance of concrete, or the year-round painting season, or the city full of Mexican workers that made Los Angeles the place where murals began to be a predominant art form. Or perhaps it was because an entire population  the majority of the city  had been disappeared in textbooks, in the media, in cultural markers of place, and needed to find a way to reclaim a city of Mexican and indigenous roots. In 1932, a mural was painted on Olvera Street, the birthplace of Los Angeles, by the great maestro David Alfaro Siqueiros, the Mexican muralist/painter. Siqueiros was the last of Los Tres Grandes (The Three Great Muralists), who after the 1910 revolution in Mexico began a cultural revolution that taught the precepts of the revolution and the history of Mexico through murals. Siqueiros, the most revolutionary of the three in materials usage, social intent and content, worked for a period of time in Los Angeles. His 80-foot-long mural America Tropical spoke to the exploitation of the Mexican worker. Commissioned by the city fathers for a Bavarian beer garden (owned by a Nazi), the mural was intended to depict a kitchsy Mexican village scene for the benefit of tourists. Instead, Siqueiros made the central image of the mural a crucified figure. America Tropical, master mural, black and white. With increasing demand for low-wage immigrant labor and massive migrations of Mexican and Central American workers to Los Angeles over the last 10 or 15 years, this image is even more relevant today than in the 1930s. The mural was partially whitewashed shortly after its completion, and then fully painted over within its first year on public view, beginning a legacy of censorship that still haunts Los Angeles. In the 1970s, 40 years after it was painted over, the image began to reemerge from the whitewash. We saw this as a symbol, an aparicion (religious apparition) coinciding with the growth of Los Angeless Mexican population and strength of the Chicano movement. America Tropical, whitewashed view from street. Siqueiros prophesied that someday every street corner of Los Angeles would have a mural, brought about by the freeing of the artist from the tyranny of laborious frescos. Siqueiros predicted that a form of muralism would exist somewhere between the moving picture and photography. He did not know of computers, but I would like to think he would have embraced the role they are now playing in mural production at Cesar Chavez Digital Mural Lab of SPARC (the Social and Public Art Resource Center, which I co-founded in 1976). Murals in Los Angeles were the first artistic medium to support and then shape a movement toward identity and justice that reached a mass population. This artistic occupation of public space forged a strong visual presence of a people who at that time (late 60s, early 70s) lacked representation in public life, with neither voice in elections, nor elected representatives. No person of Latino descent served on the City Council or on the School Board, despite the fact that in actual numbers we were fast becoming the majority of the population. Parallel to and perhaps growing from this new visual strength, many citizens of emerging Latino communities organized, with very little money and freely given labor, toward the mutual goal of improving the conditions of their communities. While many of the early Chicano Muralists were the first generation with advanced degrees in their communities, a racially unsophisticated society tied the Chicano artist to the conditions of the barrios, or Latino neighborhoods, regardless of their educational status. SPARC was born of the spirit of this movement, taking its name from the notion that it takes only a spark to start a prairie fire. The organization has been intent on nurturing this healthy fire within the city as a whole for 25 years. As the fire of muralism progressed, distinctions began to emerge. Apart from its initial purpose of creating a capacity for the imagery of the people to occupy public space, Los Angeles murals spoke to the cultural demands of previously under-represented peoples. Some works became cultural-affirmation images, asserting only that we exist as distinct cultures; others addressed the hard task of articulating and advocating for resolution of issues affecting the places where our people lived and worked. This new social power was not limited to immigrant labor nor indigenous people, but spread to the multiplicity of Los Angeles populations. African-American, Thai, Chinese, Jewish and womens murals began to appear on the streets of Los Angeles. Before long, community murals began to attract media attention and documentation. Murals began to tackle larger issues of police brutality, border crossings, drug addiction, gang warfare, and other difficulties of a life of poverty and exclusion. Early in the movement, space was freely available and uncontested. If you had the paint and the time, the wall and the message were yours. In this environment, the movement flourished. As the movement progressed, common themes emerged, variations on those themes developed, and our stories began to crystallize. 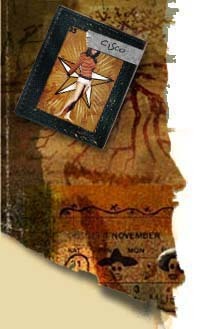 We consciously avoided Western European aesthetics, instead privileging Chicano popular culture, religious iconography, Mexican calendars, tattoos, street writing, whatever could better and more accurately portray our direct life-experience. We did not even look closely at Mexico City, an influence far-removed from the Diaspora of the Southwest. In this way, we were able to create a unique and specific art form that spoke to our own lived experience in the barrios and inner cities of Los Angeles. This movement spread to the rural communities of the Southwest and developed concurrently, though distinctly, on the East Coast. In 1970, I began working for the Los Angeles Department of Recreation and Parks, teaching art in Boyle Heights, a neighborhood in East L.A. Similar to the neighborhood I grew up in (Pacoima), Boyle Heights had cultural markers  graffiti with roll calls written on the walls that told you who lived there, what the neighborhood was called, and who was from there. But this stylized iconography often triggered destructive conflict, part of the contesting of public space by rival gang members. I began working with gang members from different neighborhoods to establish networks between them to promote peaceful solutions to such conflicts. Redirecting gang members inclinations toward public expression via my own artistic training as a painter, we began painting murals as a way to create constructive cultural markers. Our first mural, entitled Mi Abuelita ("My Grandmother"), was painted in Hollenback Parks three-sided band shell, where the Feria de Los Ni�os ("Childrens Fair") occurred annually. This work recognized the primary position of the matriarch in Mexican families as a reflection of our indigenous roots. It also marked the first step in the development of a unique collective process that employs art to mediate between rival gang members competing for public space and public identity. Through this work we formulated a group incorporating four rival neighborhoods within the same team, named Las Vistas Nuevas ("The New View"). This group, composed of 20 young people 16 to 21 years old, was made up of youth with whom I had developed relationships at several different parks as an arts teacher in the Department of Recreation and Parks Eastside parks. My teaching assignment had been to move daily from park to park to teach small childrens and senior citizens art classes. To do so, I would walk a gauntlet of young men who used the parks as a place to hang out and play dominos with their homeboys. Over a period of time, the shouts of Hey, art lady! became friendly exchanges, sharing drawings and tattoo designs of the most talented among them. Soon the young men became collaborators as well as students. Manuel Cruz�s �RAZA KILLING RAZA� mural from Ramona Gardens. While I could move between the parks, my new friends could not travel even a mile to a neighboring park for fear of reprisals by rival neighborhood gangs. The climate of the time was shaped by the civil rights movement, with events such as the Chicano Moratorium March in East Los Angeles on August 29, 1970. (This historical march occurred because Chicanos opposed the Vietnam War; Chicanos had the highest number of casualties in the war proportionate to their number in the population. The Chicanos urged non-violence for all Chicanos who participated in this event, and the Chicanos had agreed on this despite their anger towards the war. Chicanos knew that senseless hatred would ruin everything. Most importantly, it would ruin their chances of being recognized. Despite this, Ruben Salazar, a reporter for the Los Angeles Times newspaper sympathetic to Chicano civil rights activities, was killed by a police tear gas canister shot blindly into the Silver Dollar Caf�, where police thought organizers were gathering. The Brown Berets were the motivators of the Chicano Moratorium.) Much work was created subsequently around the events of August 29th. A call was made by Manual Cruz, an early organizer of youth and ex-member of the Macy Street neighborhood, in a mural he did in the Ramona Gardens low-income housing project, home to primarily Chicano families. In Raza Killing Raza (Chicanos or Latinos killing each other), Cruz suggested that Chicanos were contributing to their own oppression. Photo of team at Mi Abuelita bandshell. While painting Mi Abuelita in Hollenbeck Park, the Las Vistas Nuevas group developed a system of lookouts placed in the parks to protect us from those who did not support our efforts to work across defined territories and neighborhoods. If someone threatened to harm the group, lookouts were to whistle. Our plan was to quickly exit the scaffolding of our painting, enter the bandshells stage doors, and wait for an all-clear signal before returning to work. Medusas Head Judith Baca and crew on scaffolding. It was for this reason that the Friends of the Citywide Mural Program, a group of supporters  including attorneys called to defend the often-besieged program  decided to form a nonprofit corporation called the Social and Public Art Resource Center, now celebrating its 25th anniversary. In collaboration with members of the City Council who felt that freedom of speech was essential for the expanding mural movement, they encouraged the founding of SPARC as an arts organization that could carry out mural programs in such a way as to animate public discourse and free expression of the diverse communities of the city without direct official intervention. Great Wall site from bike trail, before park and mural. The Army Corps of Engineers first began concreting river-bottoms in the Los Angeles basin because of the problem of seasonal flooding associated with the Los Angeles River. This decision to concrete the Los Angeles River would affect the people of the city for generations to come in subsequent planning and development decisions and spiritual discord associated with the land. The concreted rivers divided the land and left ugly eyesores, carrying the water too swiftly to the ocean, bearing pollution from city streets, affecting Santa Monica Bay and depriving the aquifer of water replenishment through normal ground seepage. In a sense, the concreting of the river represented the hardening of the arteries of the land. If the river overflowing its banks regularly destroyed opportunities for the real-estate expansion that fast became the chief commodity of the fledgling city of the 1920s, then the river would simply have to be tamed. These first decisions about the river made it easier to displace historic indigenous and Mexican communities in the name of city development. Great Wall view of first 1,000 feet of mural. This development campaign ended in the 70s when an aesthetic planning division was formed to evaluate how the land surrounding the channels could be better-used and aesthetically improved. I worked with the Army Corps of Engineers Aesthetic Planning Division to develop a plan for a stretch of the channel running more than a mile alongside two schools and through a neighborhood. A park was proposed for viewing access to the channel walls. I saw an opportunity for a seemingly endless wall, 13 and a half feet tall and below ground level. Great Wall view in opposite direction. The uniqueness of the site provided a safe haven to assemble youth from different neighborhoods of Los Angeles without fear of reprisals from warring gangs, as drive-by shootings, commonplace in L.A., were virtually impossible in the Wash; and the endless wall provided a natural site for a narrative work. Fresh from organizing in the disparate communities of Los Angeles, I was hopeful about a site that necessitated a large team from many places. Unclaimed by any one gang, it was an excellent place to bring youth of varied ethnic backgrounds from all over the city to work on an alternate view of the history of the U.S., which included people of color who had been left out of American history books. Great Wall, Judy painting Dustbowl Refugees. LIFE magazine photo. The concrete river invaded my dreams, its significance becoming clearer to me as the correlation between the scars on a human body and those on the land took shape in my mind. Fernando, a charismatic leader from the original Las Vistas Nuevas team, was brutally stabbed in his own neighborhoods local store the summer of the painting of Mi Abuelita. He suffered 13 wounds to his torso and one to his face. We were devastated by the attack, but Fernando recovered and returned for the dedication ceremony, continuing his work against violence through the murals for many years until he was killed in his neighborhood park in the 1980s, 12 years after he had abandoned the life. I asked him after he had healed how he was doing with the psychological scars left by such an attack and he responded, The worst thing is that every time I remove my shirt my body is a map of violence. It was for this reason that I proposed and designed a series of tattooed images to cover and tranform the scars on his body. Great Wall, Judy with painting crew. World Wall, Installation at Gorky Park, Moscow. The Great Wall of Los Angeles production began with 80 youth recruited through the juvenile-justice system and paid by a program to employ economically disadvantaged young people. When completed, this project had employed over 400 youth along with 40 historians, 40 artists, hundreds of historical witnesses and thousands of residents involved in the production of a half-mile narrative mural. The work became a monument to interracial harmony as methods were developed to work across the differences of race and class. As a result, relationships were formed that are now 25 years long. Triumph of the Hands at Gorky Park, Moscow. Today, the basic tenets of the early mural movement still hold true. SPARC is dedicated to ensuring the maintenance of a tradition that finds expression through the hands of well-established artists and of young people with spray cans. The beginnings of muralism in Los Angeles are rooted in the need for public space and public expression. In a city where neighborhoods were uprooted through corporatization (as with the Chavez Ravine sports stadium) or the construction of freeways through low-income barrios or ghettos, or the destruction of rivers, the need to create sites of public memory became increasingly important. Waiting for the End of the Twentieth Century by Alexi Begov, Russia. From successful mural productions, methodologies were gleaned that laid the foundation for subsequent SPARC projects. During its production, one of the youth assistants suggested making the Great Wall global. We should take what we learned working with different nationalities here in Los Angeles to the world, the 16-year-old said. In 1987, we began work that still continues on The World Wall, a portable installation of murals by artists from countries around the world offering expressions of world peace. Balance & Triumph of the Hearts at Plaza de la Raza, Los Angeles. Through the World Wall project, artists were asked to articulate a particular moment, an apex of change for their countries that best described the time in which they live and which could benefit people of other countries and realities. The concept of from the neighborhood to the global motivated the development of the World Wall, a traveling installation mural equal in length to one 350-foot segment of the Great Wall, which could be assembled indoors or outside in a 100-foot diameter circle as an arena for ritual and dialogue. The World Wall: A Vision of the Future Without Fear premiered in the summer of 1990 in Joensuu, Finland, where our Finnish collaborators (Sirka Lisa Lonka and Aero Matinlauri Juha Saaski) added a work called Alternative Dialogues. That same summer, Alexi Begov of Moscow produced a work during the fall of the Communist Party in the then-Soviet Union called Waiting for the End of the 20th Century. In 1999, an Israeli/Palestinian collaboration was added: Inheritance Compromise by Adi Yukutieli,(Israel Jewish) Akmed Bweerat (Israel Arab) and Suliman Mansour (Palestinian). Each work has represented years of intense dialogue between the artist-collaborators and work with the children of their home villages. The newest addition in 2001  Tlazolteotl: The Creative Force of the UnWoven by Martha Ramirez Oropeza and Patricia Quijano Ferrer  represents the changing role of Mexican urban/indigenous women and Mexicos relation to the Mexican-American Border. These works, combined with the four completed by my teams in Los Angeles, create a giant arena for dialogue while encompassing the viewer in a healing circle. The murals function as a visual primer for societal transformation toward balance and peace. This work continues to move internationally adding work as it travels. Works are in planning from the First Nation people of Canada, the Australian Bushwoman, and prisoners of Brazil. 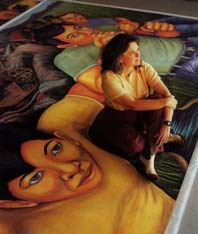 In 1988, the concept of the Great Wall was taken to a city-wide level in Los Angeles with the Neighborhood Pride: Great Walls Unlimited Program, which has so far sponsored more than 104 murals by artists from different parts of the city reflecting the issues of diverse groups in their own neighborhoods. Most Recently, SPARC has been experimenting with digital mural-making techniques in the SPARC/Cesar Chavez Digital Mural Lab, created in 1996. This new collaboration between SPARC and the University of California at Los Angeles is experimenting with new methods of producing permanent murals via computer technologies. Research in the lab is yielding new substrates for murals, methods of expanding community dialogue via the Internet and murals that can be replicated if censored or destroyed. Photo of Shoulder To Shoulder banners in situ, Broadway. Also, during the summer of 2001, SPARC collaborated with the Human Relations Commissions Shoulder to Shoulder Program to develop a project that would bring together youth from different ethnic and class backgrounds from around the city of Los Angeles to discuss issues of race, violence, class and reconciliation. Applying processes developed in mediation between rival neighborhoods in East Los Angeles and the Great Wall, SPARC created an inter-disciplinary arts curriculum that facilitates dialogue between youth about these issues. Are We Both Americans? Banners from Shoulder To Shoulder. In the meantime, SPARC is continuing to invent ways to create new public monuments that reflect marginalized people such as urban immigrant domestic workers, campesinos in the fields of California and others. While the methodology of the work is consistent from project to project, the outcome always changes. Our approach to art allows for truly democratic processes and critical reflection to facilitate different artistic visions for and about our society. Judith Baca is a professor at UCLAs Cesar Chavez Center of Interdisciplinary Studies of Chicano/a Studies and World Arts and Cultures Department, as well as the co-founder of SPARC.